The standard small size reel in the yellow Kodak boxes or packets was 50' ft. The yellow Kodak spool covers were Standard 8mm, while the later Super 8 mm spool covers are black. When numbering the film reels in chronological order, the postage or date on the film packaging and style of typography can be helpful with dating. 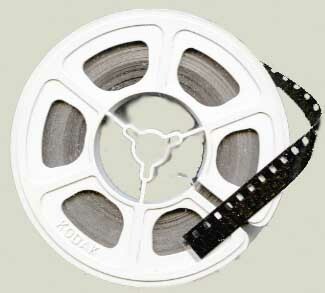 Beginning in the late 1950's the various film reels include Standard 8mm, and Super 8mm gauge film. In this unsorted collection, the film reel capacities are 50' ft. and 400'ft. size reels. Film stock manufacturers included are Ferrania, Kodak, Ilford, and Agfa-Gevaert. All of these film stocks were colour reversal ones. To sort into suitable order ready for transfer, start with the small 50'ft. reels. The earlier, Standard 8mm, ones came with grey plastic reels and yellow plastic covers. Sort these ones first into chronological order using any written captions as guide. Where there are no clues to a film reels' content, often the film box or wrapper will have a postage date stamp and former address that can help with sorting into date order. Next, take the black plastic spooled Super 8mm ones with the black plastic covers and again sort into date order as before. 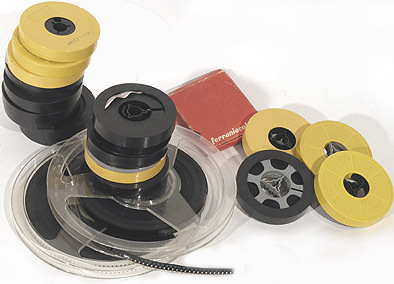 The card boxed Ferrania reel is Standard 8mm and belongs with the earlier ones. Number each reel in consecutive order as you go along. In this case, "1" - "19" Next, examine the larger reels to determine the guage, again placing Standard 8mm before Super 8mm. The larger plastic reels shown are of 400'ft. capacity. The lower reel having 300'ft. of film and the one above it, 200'ft. The total footage of 8mm film shown in the above picture is approximately 1,350'ft.